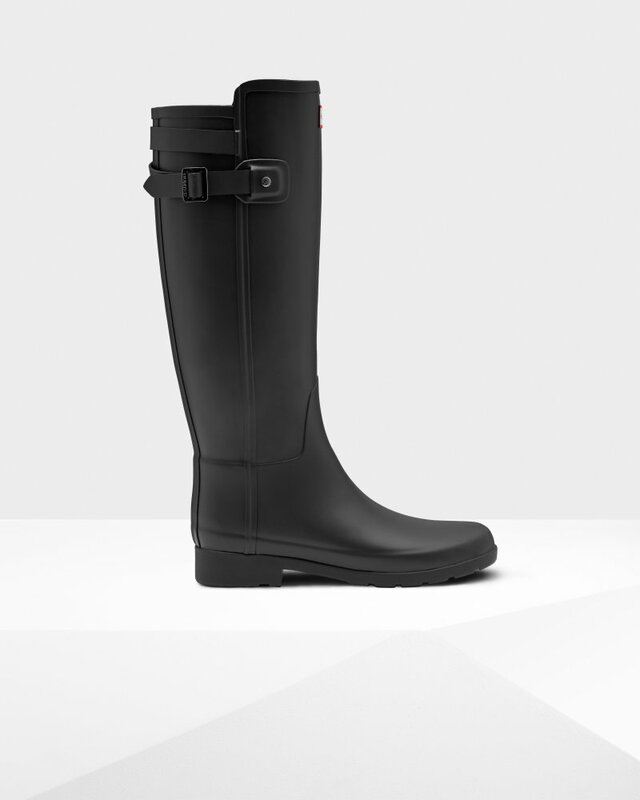 Women's Refined Slim Fit Back Strap Rain Boots is rated 4.2 out of 5 by 280. Una versión ceñida de la icónica bota Original con un nuevo diseño de aspectos clave para crear una silueta más personalizada. Las Wellington refinadas Original con correa trasera presentan una parte posterior con un tono diferente envuelta por una correa y una hebilla, mientras que la suela se ha moldeado para ofrecer un aspecto más clásico. This style is for general wear. For performance boots, designed for long-term use on hard terrains, we recommend products from our Balmoral range. Rated 1 out of 5 by Cheyenne from Cracking/Splitting Rubber I loved these at first, as they're cute and are great in a downpour (at least they were at first). After a while, I noticed that a couple of cracks started forming on the feet. The largest one is maybe 3-4 inches, and I can see/feel the lining through it when I walk, meaning my foot gets wet through the shoe (rendering a rainboot pretty much useless!). I'm not talking normal wear and tear (there are a few scuffs that are normal); I even noticed a small hole on the seam around the ankle when I bend my ankles while wearing them. I don't wear them intensely either, maybe 10-15 times a year for a few hours at a time. The left boot just has a couple of small tears, but the right looks like someone came at it with a machete! I got them a little over two years ago, so the warranty has expired, but for such pricey shoes, you'd think they'd hold up a little longer! Rated 5 out of 5 by Anne from Great boots! Fits perfectly! I hope the quality is worth the price. Ive received a lot of compliments with these boots. Looks very chic! Rated 3 out of 5 by mescobedo07 from Cute boots I bought them a month ago and I saw them fell in love! However I have bigger calves and they just don’t fit. My calf size is about 15 inches. I tried sizing up but they still were to small. If you have smaller calves then I think they are really cute and worth the investment. Rated 4 out of 5 by rylee19 from LOVE THE BOOT - VERY SLIM I fell in love with the style of this boot and had to have them. The word slim is no joke. I normally wear a size 7 or 7.5 depending on the shoe, I got an 8 and they fit great on my feet and ankles however, the calf is very slim. They are a bit tighter than I would like, but over all they are amazing and I plan to keep and wear often. Rated 5 out of 5 by UtahAli from Beautiful, Sleek, Elegant Hunter's most stylish boot. I've absolutely loved wearing these. The classic look makes it simple to wear and dresses up even the most boring outfit. Rated 1 out of 5 by Mili from Disappointed I received these as a gift about a year ago and I loved them however they started ripping in multiple places :( for $200 they should be a much better quality .. I usually never write reviews but this is just so upsetting since I only wore them casually so I don’t understand how they could rip that easily.